We all know the best knife is a sharp knife, but honing and sharpening become futile when your knife blades are playing bumper cars in a knife drawer or knife bag! Knife edge guards are highly recommended, if not necessary, for keeping your knives from being dinged, nicked, and dulled while being carried in a knife roll or stored loose in a drawer. Got it. I do need knife covers. So which ones do I get? Well that is the question! It comes down to quality preference! Thin or paper edge guards work for a limited time before the knives cut through them, and you have to purchase again. 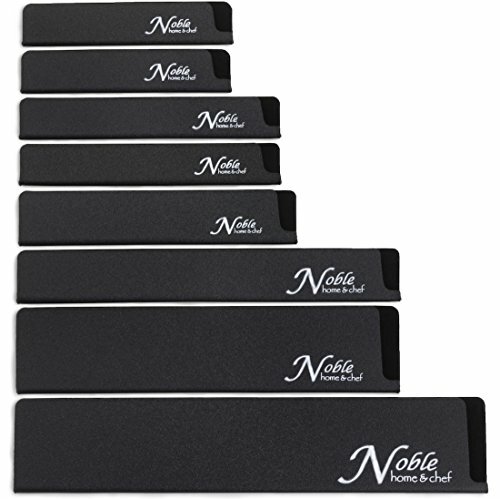 If you're looking more for a 1-time buy, Noble Home & Chef's edge guards are a high-quality, but cost-efficient solution. Why Noble Home & Chef? We didn't name ourselves Noble for nothing! It is our primary goal to provide you with quality and trustworthy products for your home and kitchen. Our knife sheaths are no exception! What Sets Noble Home & Chef's Edge Guards Apart? GENTLE ON YOUR BLADES: Our knife guards are felt-lined so that they protect your knives' integrity without marring their finish or dulling their blades as they slide in and out of the sheath. SAFER, BPA-FREE MATERIALS: Noble Home & Chef's knife covers are constructed from ABS plastic, which unlike its common alternative PVC plastic, is BPA-free and non-toxic. LONG-LASTING CONSTRUCTION: In addition to it being safer, we chose ABS plastic over PVC for our knife sleeves as it is harder, more resistant to abrasions, and has a higher impact strength. We also designed our knife sleeves to be thick, cut-proof, and more durable than thinner, flimsier edge guards. UNIVERSAL KNIFE BLADE SIZES: 8-Piece assorted knife protectors are designed to fit most paring, utility, boning, Santoku, chef, and bread knives. See dimensions below to determine if your specific knife set is well suited!